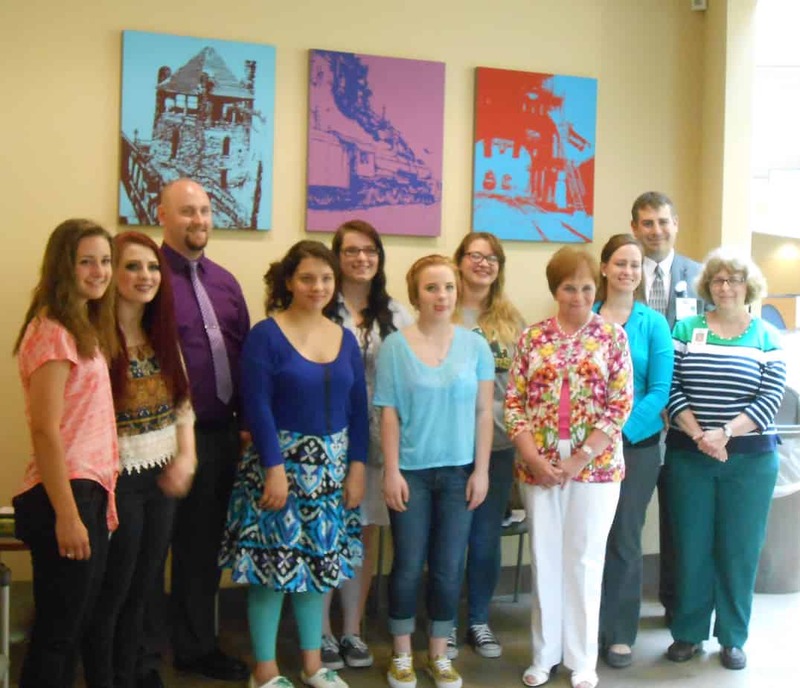 UPMC Altoona, Altoona Area School District representatives, teachers and Altoona Area High School National Art Honor Society students Monday unveiled a series of railroad-themed murals designed to enhance the hospital’s area at Station Medical Center. The art’s purpose is to provide pure visual enjoyment to uplift spirits, stimulate conversation, and recall the rich history of Altoona and Blair County for patients, their family members and passers-by, according to the National Art Honor Society students. The three-canvas mural is based on photographs taken by Dave Seidel, a local photographer. Friends of UPMC Altoona served as the artists’ benefactor, donating the funds necessary to buy raw materials. Altoona Area High School National Art Honor Society students and hospital officials unveiled new art located in an outpatient waiting area of UPMC Altoona’s area of Station Medical Center. Participants were (from left): Brooklyn Haugh, Madeline Quinn, students; Ron Bowser, art instructor; Orianna Green, Brandi Wilt, Kathryn Elder, Amber Gordon, students; Peggy Cawthern, president, Friends of UPMC Altoona; Laura Kozdra, art instructor; Mike Corso, executive director of Imaging, Cardiology & Radiation Oncology, and Sharon Wall, art instructor. “It is our pleasure to play a part in the development of the arts in the Altoona area,” said Peggy Cawthern, president of Friends of UPMC Altoona. “We are once again pleased that we were able to contribute the materials to the art students of AAHS and again we see their talents unfold. Our community is truly blessed to have such talented young men and women who, with the guidance of their teachers, have produced an impressive piece of artwork for all of our community to enjoy. Friends of UPMC Altoona raises funds to benefit patients and employees. This is the second consecutive year for the collaboration between Friends and art students. A year ago, the students donated nine canvases depicting different Altoona neighborhoods, the Cathedral of the Blessed Sacrament, Baker Mansion, Blair County Courthouse, The Mishler Theatre, and the Altoona Railroader’s Museum, which now hang in public areas of the hospital. Again this year, Altoona Area High School art instructors and National Art Honor Society advisors Sharon Wall, Ron Bowser and Laura Kozdra supervised the students. National Art Honor Society student and hospital volunteer Brandi Wilt drew the images onto the canvases over several months, investing about 20 hours in the sketches. Then, other honor society students completed the works. Brandi volunteers in the hospital gift shop. “These paintings are truly a group project,” Sharon Wall said. “National Art Honor Society members have worked on them over the school year, after school, when they had extra time in class and in conjunction with the community service program at the high school. Students who worked on the project are: Casandra Banks, Chandra Banks, Jaley Blackie, Vanessa Blanchard, Ayla Conrad, Destiny Eames, Kathryn Elder, Orianna Green, Amber Gordon, Brooklyn Haugh, Alyssa Hughes, Molly Malone, Stephanie Mock, Madeline Quinn, Delaney Sheetz, Kristen Stoltenberg, Olivia Walter, Avery Wilkes, and Brandi Wilt. Here are some comments by the students as part of written reflections. A world-renowned health care provider and insurer, Pittsburgh-based UPMC is inventing new models of accountable, cost-effective, patient-centered care. It provides more than $887 million a year in benefits to its communities, including more care to the region’s most vulnerable citizens than any other health care institution. The largest nongovernmental employer in Pennsylvania, UPMC integrates more than 62,000 employees, 22 hospitals, 400 doctors’ offices and outpatient sites, a nearly 2.3-million-member health insurance division, and international and commercial operations. Affiliated with the University of Pittsburgh Schools of the Health Sciences, UPMC ranks No. 10 in the prestigious U.S. News & World Report annual Honor Roll of America’s Best Hospitals — and No. 1 in Pennsylvania. For more information, go to UPMC.com.